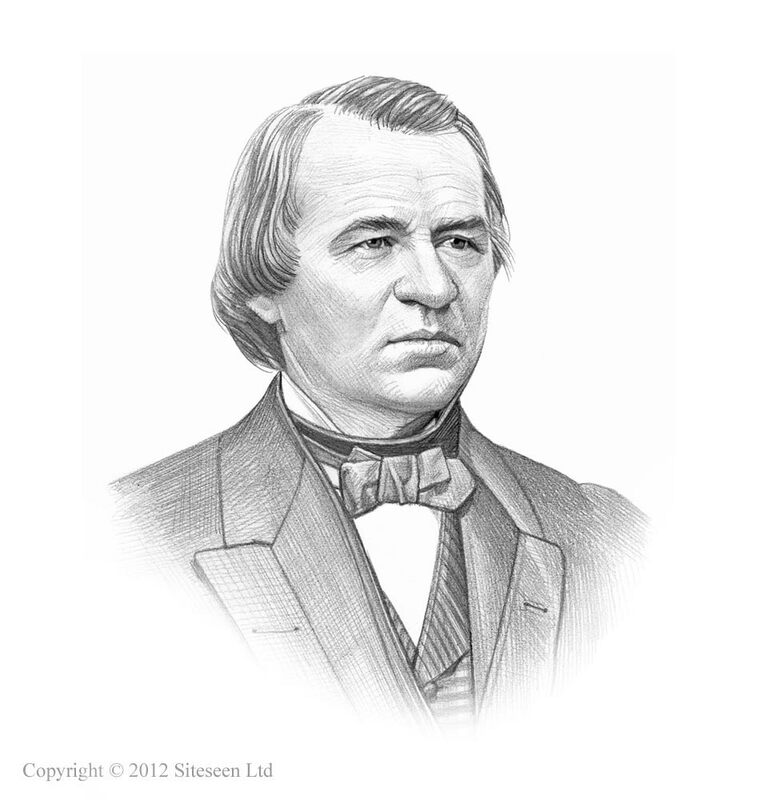 Reconstruction Era Facts and Timeline: Andrew Johnson was the 17th American President who served in office from April 15, 1865 to March 4, 1869. One of the important events during his presidency was the Reconstruction of the South following the Civil War. Summary and definition: The end of the conflict turned to the Reconstruction of the South after the Civil War. This period is referred to in American history as the Reconstruction Era and lasted from 1865-1877. Reconstruction is the term applied to the time period, or era, when the South was occupied by United States Federal troops whilst state governments and economies were established and the infrastructure of the South was rebuilt. Even before the end of Civil war President Lincoln began the task of restoration. On January 1, 1863 President Lincoln issued the Emancipation Proclamation setting the scene for the abolition of slavery. On December 8, 1863 he issued a Proclamation of Amnesty and Reconstruction for those areas of the Confederacy occupied by Union armies offering pardon to Confederates who would swear to support the Constitution and the Union. He then introduced the Ten Percent Plan. The Reconstruction plans of President Lincoln were opposed by radical Republicans and passed the Wade-Davis Bill, which the President vetoed. The next measure was the 13th Amendment to the Constitution, abolishing slavery, which was passed by Congress on January 31, 1865. And President Lincoln had enlarged powers of the Freedmen's Bureau. There was opposition to some of Lincoln's plans for Reconstruction by radicals in Congress who believed the South should just revert back to the old ways. By the time of Lincoln's assassination the President and Congress were at a stalemate. The Reconstruction Era covered a period of 12 years in American History and started with the End of the Civil War and the Assassination of President Abraham Lincoln. President Lincoln was pronounced dead on April 15, 1865 and Vice President Andrew Johnson assumed the presidency on the same day. Just hours after celebrating the end of the Civil War with the Surrender of Appomattox the nation was plunged into shock and mourning with the murder of President Lincoln. The assassin, John Wilkes Booth and his co-conspirators, had believed their action would help the Confederacy. But the South was just as appalled as the Northern states. People in the South feared that the people of the North would want revenge and would wreak a terrible retribution on the former Confederate States of America. This was the situation when President Andrew Johnson assumed the presidency. He had only been inaugurated as Vice President six weeks before the assassination of President Lincoln and had previously served as a Senator. He lacked experience and had neither the intelligence, patience nor the stature of Lincoln. He soon found himself at odds with the radicals in Congress and did not have the ability to compromise. Eventually Andrew Johnson would become the first American President to be impeached although he was acquitted. He was followed by President Ulysses S. Grant. The Civil War hero and General of the Union army, Ulysses S. Grant, became the third President during the Reconstruction Era. The main focus of the Grant administration was on Reconstruction, and he worked hard to reconcile the differences between the North and South whilst attempting to protect the civil rights of newly freed black slaves. Although an honest man his presidency was marred by a series of scandals involving corruption. After setting the scene for the Reconstruction Era this article continues to chart the Important events of this difficult period in American History with fast, Reconstruction Era facts presented in a timeline format. Interesting Reconstruction Era Facts and Timeline for kids are detailed below. The history of the Reconstruction Era is told in a factual timeline sequence consisting of a series of interesting, short facts providing a simple method of relating the history of the Reconstruction Era history for kids, schools and homework projects. January 16,1865: General William T. Sherman issues Special Field Order 15, setting aside confiscated plantation land along the coast of South Carolina and Georgia for black families to settle in 40-acre plots. 40,000 freedmen are living on the land by June 1865. March 3,1865: The Freedmen's Bureau Bill, (the Freedmen's Bureau) was a temporary government agency initiated by President Lincoln to assist freedmen (freed ex-slaves) in the South. May 29, 1865: President Johnson's amnesty proclamation was more severe than President Lincoln's. The proclamation deprived all former military and civil officers of the Confederacy of any power. All those who owned property worth $20,000 or more. Their estates were made liable to confiscation. November, 1865: A "Colored People's Convention" assembled at Zion Church in Charleston to condemn the Black Codes. December 1, 1865: Johnson Declares End to Reconstruction. Congress is outraged, and Radical Republicans refuse to recognize new governments in southern states. February 2, 1866: A black delegation led by Frederick Douglass meets with President Johnson at the White House to advocate black suffrage. The president expresses his opposition, and the meeting ends in controversy. Apr. 28, 1866: Joint Committee on Reconstruction reported that the ex-Confederate states were in a state of civil disorder, and had therefore not held valid elections. It also maintained that Reconstruction was a congressional, not an executive, function. August, 1868: A total of six states (Arkansas, North Carolina, South Carolina, Louisiana, Alabama, and Florida) had been readmitted to the Union, having ratified the Fourteenth Amendment as required by the first Reconstruction Act. September 28, 1868: The Opelousas Massacre in Louisiana in which 200 to 300 black Americans are killed. February 3, 1870: Fifteenth Amendment ratified stating that a citizen's right to vote cannot be taken away because of race, the color of their skin, or because they were previously slaves. 1877: Rutherford B. Hayes removes troops from South Carolina and Louisiana, signaling the end of Reconstruction.